Just when all of the false information presented about the relationship between Jesus and Mary Magdalene in The Da Vinci Code is finally beginning to fade, someone has decided to look at The Last Supper painting from a different angle: backwards. According to Good knight! New images found in Da Vinci's 'Last Supper'?, a computer analyst has discovered that if you reverse the image of Da Vinci's The Last Supper and superimpose the image over the original painting you find some, shall we say, interesting changes to the painting. 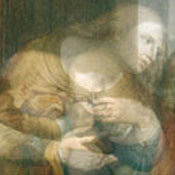 Slavisa Pesci claims to have discovered new images in the 15th mural in the dining hall of Milan’s Santa Maria delle Grazie church by superimposing a reverse image on the original image. When doing so, Pesci said he observed, for example, that the two figures on either end of the long table appear to become knights, and that another figure appears to be holding an infant. One of the odder things about the Jesus Myth movement, such as it is, is how permeated it is by flakiness. I do not mean the obvious flakiness in denying the well-attested existence of Jesus. Rather, I mean a weird, over-the-top, desperation, do-even-heavily-biased-people-believe-this stuff kind of flakiness. Thought those skeptical of Christianity were driven by cold, dispassionate logic and reason? Think again. In this post, I highlight some of the most flaky of the Jesus Myth movement. Jesus was a myth but one that properly understood can raise your cosmic consciousness or reveal you celestial nature or lead to ancestral unity. No, followers of Jesus will lead to the destruction of all mankind! Or perhaps he was a secret code representing the life of Julius Ceasar. No, he was a metaphor for the Emperor Trajan! The descriptions of these books are not mine but come from Amazon. The emphasis, of course, is added. This is the second in an occasional series of posts about various bits of news or commentary that I come across that are simply so astoundingly absurd that it is beyond comprehension how someone can believe them. I base the title on radio and television talk show host Glenn Beck's comments that such things are so mind-boggling that they make your head want to explode. Hence, your head goes *pop*. In addition to being one of the leading apologists for the resurrection of Jesus, William L. Craig is one of the leading proponents of the Kalam Cosmological Argument and other philosophical arguments for God's existence. Dr. Craig is also one of the academic defendants of Christianity most available online, with many of his articles available on the internet. Recently, Dr. Craig launched his Reasonable Faith website. It includes links and descriptions for all of his online articles, audio files of his debates, lectures, and interviews, an open forum on a range of philosophical and apologetic issues, and a weekly Q & A section where Dr. Craig responds to a question submitted to his website. This week, Dr. Craig responds to one attempted refutation of the Cosmological and Teleological (Design) Arguments for God's existence: the supposed multiverse. Previous Q & A sessions are just as interesting. Check them, and the rest of the website, out. The idea that strapping a bomb to someone so that he may enter a marketplace crowded with unarmed civilians and blow himself up is so disgusting to me that I have never understood how any person of any faith could possibly support it. Innocents are harmed, maimed and killed -- many of whom may have no part in the underlying conflict other than living on the wrong side of town. There seems to be few acts of cruelty that can compare when considering the random nature of the people killed and the extent of the harm inflicted. Yet, I have been surprised that many in the Muslim world have either supported or, at minimum, said nothing against this horrendous tactic. Ethics and the Third Person--a return to secular ethical grounding? Introductory note from Jason Pratt: I am here appending in several parts some excerpts from an unpublished book of mine, originally composed late 99/early 2000, wherein I work out a progressive synthetic metaphysic. The current topic is ethical grounding, and an analysis of problems along the three general lines of ethical explanation. The previous entry, which critiqued an extremely common theistic variant of the third general ethical theory, can be found here. Also, incidentally, I have gone back and updated links in my previous entries, to make it easier for navigation between them. Any entry with a subsequent entry, now features a hyperlink at the bottom leading to the next entry. I plan to include a 'prequel' link to "The Heart of Freedom" at the bottom of each entry, but I haven't gotten around to doing it yet. Hopefully next time! In Book 20 of Josephus' Antiquities there is what could be called a passing reference to Jesus in a paragraph describing the murder of Jesus' brother, James, at the hands of Ananus, the High Priest. Jewish Antiquities 20.9.1 (emphasis added). Creationism: A Threat to Human Rights?